Now this is cool. 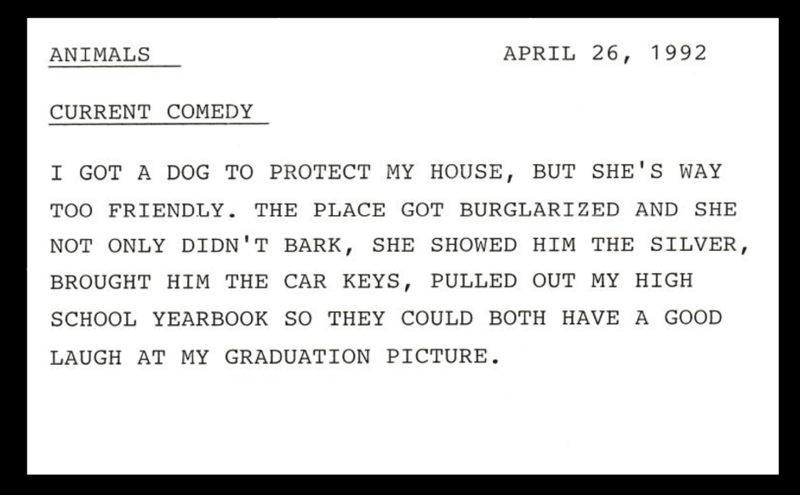 Legendary comic Phyllis Diller’s legendary joke file of more than 52,000 index cards is now at the Library of Congress, and they have invited all of us to help digitize the files. It’s like Wikipedia; anyone can participate, for just one joke or for hundreds or thousands. Just take a look at one of the jokes and type it up (some of them are just a few words). There are a few simple rules about formatting to indicate underlines, strikeouts, etc. Or, you can be a “reviewer” and just confirm or correct some of the draft transcriptions. Even if you don’t want to participate, it is a lot of fun to scroll through the files online, a real artifact of an era, and of course very funny. Next PostNext See Kong’s Skull Island in 360VR! Jerry Roberts and Doug Heller are hosting a new podcast called “The Cave of Wonders,” a loving tribute to the special magic of Disney films. Episode one “looks into the tao of Disney and what it means to us and to our culture. 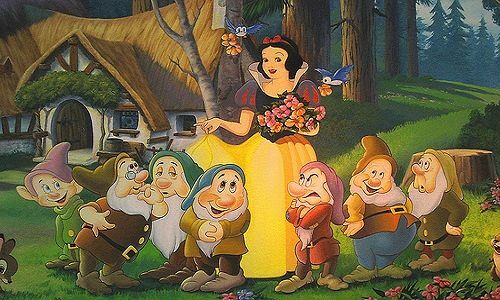 Then, a discussion of Disney’s first animated feature, “Snow White and the Seven Dwarfs.” Roberts and Heller answered my questions about the podcast. What do you mean, the “tao” of Disney? The ‘tao’ of Disney refers to the fact that Walt’s vision seems to have written the universal language for the animated feature. What has sprung from it is the central core of how animated features are made and ultimately what we come to expect from them. In truth, there’s Disney and then there’s everyone else. It seems to stand above the other studios in terms of their output. What elements of Walt Disney’s original vision are most evident in the studio’s productions today? Today they are still holding on to the emotional levels and character developments that Walt put into place. The original vision of Walt Disney can be seen most evidently in his first five animated features; Snow White and the Seven Dwarfs, Pinocchio, Fantasia, Dumbo and Bambi. The emotional levels are present even in films like Frozen and Zootopia but also the desire to go the extra mile. It’s the writing that has maintained Disney’s vision. Characters and ideas come first, not just the desire to jump onto whatever is popular at the moment. You can tell me — who is your all-time favorite Disney animated character? Live action character? Song? Uh-boy. The Disney company is 93 years old and they’ve made how many movies? I really can’t even begin to list the characters and songs that are my favorites. There isn’t one, there’s shouldn’t be. Disney has such a rich history with its characters and its music that choosing just one is impossible. Will Disney ever return to hand-drawn animation? At this point, no. Disney tried nine years ago to test the market to see if it would work again with The Princess and the Frog but it didn’t do as well as they had hoped. CG is the new landscape and it doesn’t seem to be going away anytime soon. Which Disney movie is the scariest? For me, the scariest Disney picture was always Pinocchio. Concept terror, of course. I can’t imagine a more frightening scenario than bad children being turned into donkeys and sent off to work in salt mines and circuses. That’s a horrifying idea! They are punished, essentially, forever. They can’t talk so their parents think that they have effectively disappeared off the face of the Earth. I didn’t see this film when I was a kid, but if I had the message would have been with me forever. Behave yourself! The movie that made people cry? I’m going to say Bambi for the death of his mother, but I can’t imagine anyone not being touched by Dumbo’s late night visit to his mother’s cage after she’s been locked up. At the moment moment when little Dumbo wipes his tears on his mother’s trunk I defy anyone with a heartbeat to keep a dry eye. How do you do a podcast about such a visual medium? Conversation and lots of it. You speak as if the listener knows what you’re talking about. Doug and I assume that our listeners have already seen the film that we are talking about. We speak of the visuals in a specific way, I don’t think there’s quite a difficulty in that. It’s like talking about movies with your friends. If you could inspire your audience to check out one overlooked Disney gem, what would it be? The Rescuers Down Under. I know why the movie was overlooked in 1990 but I’m not sure why it continues to get overlooked today. Most people don’t know that this film came out between The Little Mermaid and Beauty and the Beast, and even fewer know that it had the sad misfortune of opening on November 16, 1990, the exact same day as the release of Home Alone. That’s really too bad because this movie works on so many levels, I hate to think that anyone is overlooking it. The animation in this film is gorgeous, and the story is beautifully told as well. It’s a great adventures. It’s got great action scenes, a great villain voiced by George C. Scott, the backgrounds are breathtaking. It’s fun, it’s exciting, it’s a fantastic adventure film. 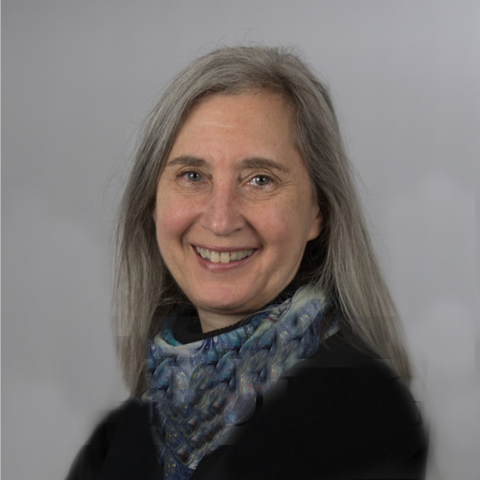 Why are we overlooking this one? 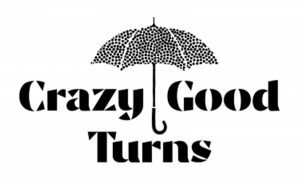 My favorite new podcast is “Crazy Good Turns,” stories of kindness and generosity. Episodes so far include a program to send military veterans to the world’s disaster zones, a preacher who was “conned by God“ to provide inspiration and support in a troubled city, a sort of Johnny Appleseed of children’s playgrounds, and a family who created a program to help first responders in memory of a brother who died on 9/11. They do a good deed of their own by including music from emerging and innovative performers in the podcast. It is available on iTunes and Stitcher, and you can suggest your own good deeds or music groups for future episodes.